« Homepage / Other Drugs / "Toluene poisoning"
Toluene, also known as methylbenzene or phénylméthane is an aromatic hydrocarbon in the form of a liquid transparent, very common and used as a solvent or industrial departure. Handling there are risks for the health of the user. Disorders caused among workers are also recognized in respect of the occupational disease. Even if a significant amount of toluene, 25% to 40%, expired in unchanged form by the lungs, the largest part is metabolized and excreted through other channels of elimination. The main route of toluene metabolism is hydroxylation in benzyl alcohol by the chain of the enzymes of the cytochrome p450 (CYP) family. There are five CYPS which have an important role in the metabolism of toluene, CYP1A2, CYP2B6, CYP2E1, CYP2C8 and CYP1A1. The first four appear to be involved in the hydroxylation of toluene in benzyl alcohol. However, the CYP2El seems to be the main enzyme involved in the hydroxylation of toluene, accounting for about 44% of the metabolism of toluene there is ethnic variability, in the Finnish population, for example the primary enzyme is the CYP2B6. CYP2E1 catalyses the formation of benzyl alcohol and p-cresol while the CYP2B6 produces compared little p-cresol. It is estimated that in humans, benzyl alcohol is metabolized to benzaldehyde by CYP rather than by alcohol dehydrogenase. However, this belief does not appear to be universal. Benzaldehyde is metabolized, in turn, benzoic acid, mainly by aldehyde dehydrogenase-2 mitochondrial (ALDH-2), while only a small percentage is metabolized by the ALDH-1. Benzoic acid is metabolized either benzoyl glucuronide or Hippuric Acid. Benzoyl glucuronide is produced by the reaction of benzoic acid with acid glucuronic (glycuroconjuguaison), which represents 10-20% of benzoic acid elimination. Hippuric Acid is also known as a benzoylglycine and is produced from benzoic acid in two steps: first benzoic acid is transformed into benzoyl-CoA by the enzyme benzoyl-CoA synthetase, and benzoyl-CoA is converted into Hippuric Acid by benzoyl-CoA: glycine N – acyltransferase. Hippuric Acid is the major urinary metabolite of toluene. Hydroxylation in cresols is a minor route in the metabolism of toluene. The majority of cresols are eliminated in unchanged form in the urine, but a part of p-cresol and o-cresol is excreted as conjugates. Studies in rats have shown that p-cresol is primarily conjugated with glucuronic acid to produce p-cresylglucuronides, but this is may be not applicable to humans. O-cresol appears to be primarily excreted in the urine in unchanged form or as conjugate glycuro or sulfur. There seems to be some differences on the question of whether or not, m-cresol is a product of the metabolism of toluene. When exposure to toluene, there usually simultaneous exposure to several other chemicals. Often toluene exposure is concomitant with exposure to benzene and, as both substances are to a certain extent, metabolized by the same enzymes, the report of their relative concentrations will determine the rate of elimination. Of course, more toluene is long to eliminate, it is likely to have adverse effects. Tobacco consumption and people exposed to toluene, alcohol partly determines the Elimination of the toxic. Studies have shown that even an acute modest ethanol consumption could significantly reduce the dissemination or the Elimination of toluene in the blood by increasing the exposure of tissues. Other studies have shown that chronic ethanol consumption can accelerate the metabolism of toluene by induction of CYP2E1. It has been shown that smoking could increase the rate of elimination of toluene, perhaps because of enzyme induction. Diet may also affect the Elimination of toluene. A diet low in carbohydrates and starvation were all presented as capable of causing induction of CYP2E1 and, therefore, to increase the metabolism of toluene. A low protein diet can lead a total CYP content decrease, reducing the rate of elimination of the drug. Hippuric Acid has long been used as an indicator of exposure to toluene.However, there appears to be a doubt as to its validity. There is significant production endogenous Hippuric Acid in humans, with changes in inter – and intra-individual influenced by such factors as food, drug treatment, alcohol, etc. This suggests that Hippuric Acid may be an indicator of exposure to toluene unreliable. It has been suggested that urinary Hippuric Acid, traditional marker of toluene exposure was simply not enough sensitive to differentiate between the contacts of the unexposed. This led to other metabolites as markers of exposure to toluene. Urinary o-cresol may be more reliable for the biomonitoring of toluene exposure because, unlike Hippuric Acid, o-cresol is not found in detectable levels in non-exposed subjects. O-cresol may be a less sensitive marker of exposure to toluene than Hippuric Acid.O-cresol excretion may be a reliable method for measuring toluene exposure because o-cresol represents less than 1% of the total of the Elimination of toluene. Acid benzylmercapturic, a minor metabolite of toluene, is produced from benzaldehyde. 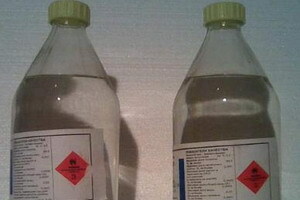 In recent years, studies have suggested to use acid benzylmercapturic urine as a marker of exposure to toluene preferential, because it is not detected in the background subjects, that it is more sensitive than Hippuric at low concentrations acid, it is not affected by food or drink, that it can detect exposure to toluene at a level of about 15 ppm, and shows a better dose-response relationship with exposure to toluene than Hippuric Acid or o-cresol. Serious negative effects on behavior are often associated with excessive exposure to toluene inhalation deliberate solvent-related. long term toluene exposure is often associated with events such as syndrome psychoorganique of Visual evoked potentials (ENP), toxic polyneuropathies, cerebellar, cognitive impairment and a pyramidal, optic atrophy and anomalies of the brain lesions. Toluene causes postural tremors by an increase in the extracellular concentrations of gamma-aminobutyric acid (GABA) in the cerebellar cortex. Treatment with agonists of GABA such as, benzodiazepines provide some mitigation of earthquakes induced by toluene, as ataxia. An alternative to drug treatment is the thalamotomie. Earthquakes associated with toluene abuse do not appear to be a transient symptom, but there is an irreversible and progressive symptoms evolution that continues after the termination of the solvent poisoning. There is some evidence that a low level of exposure to toluene may cause disturbances in the differentiation of astrocyte precursor cells. This does not appear to be a major risk for adults, but exposure to toluene of pregnant women during the critical phases of fetal development can cause serious disorders of neuronal development.